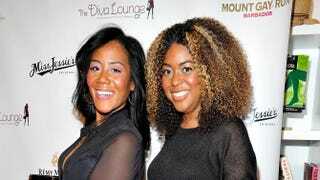 Co-owners of Miss Jessie’s, and sisters, Miko and Titi Branch attend the 2011 Diva Lounge celebration at the Tracy Reese Boutique on May 18, 2011, in New York. That right there is the articulation of a compounded issue. For accomplished people, the already weighty symptoms of depression are exacerbated by the imposition of other folks’ perceptions, similar to the one vocalized by said friend. It’s as if people have a right to their feelings, so long as they’re not celebrities, public figures, folks with really good jobs, millionaires, definitely not billionaires, beautiful people or anyone else who should seemingly be too busy enjoying the accoutrements of achievement to become melancholy. We’ve seen the proof in tragic news stories, most recently the apparent suicide of Titi Branch, co-founder of the Miss Jessie’s natural-hair product empire. She was an eyeful of lovely, a serial entrepreneur driven by intelligence and supply-and-demand savvy. The joy we thought she should have been feeling—maybe even the joy she thought she should have been feeling—apparently didn’t exist, and so she made a final decision to find peace. 1. It can create pressure to stifle authentic feelings in favor of maintaining a facade. 2. It can force people already in emotional and mental turmoil to justify their depression, which can push them to seek solace in the self-medication of their choice. 3. It often minimizes the emotions that we all experience, and that ultimately connect us. Making good money, shaping an impressive career and capitalizing on the benefits of higher education don’t disentitle anyone from experiencing the spectrum of human emotion; nor do they preclude anyone from clinical disorders. Such belief is a danger to mental health. Forty percent of us are in denial about our depression. Thirty-eight percent of us are embarrassed or ashamed to be treated for it. And 31 percent don’t want or refuse help because, despite sometimes incapacitating misery and crippling hopelessness, we think we’ve got this. Particularly those of us who are used to checking items off our lists of personal and professional aspirations. If you’re accustomed to zeroing in on a goal and driving it into actualization, recovering from depression may seem like one more thing you can do yourself. That’s not how mental-health care works, particularly since most major depressive cases need professional treatment. By now, from the sharing of so many painful exemplifications, we’ve learned that no one is exempt from the burden of faltering mental health. But we have a hard time giving everyone that space when some of the everyones are people who seem as if they have every reason to be brimming over with glee. Beyond the enchantment of their best Instagram-ready smiles and seemingly fabulous lives is the vulnerability to experience emptiness, inferiority and anguish. Folks will still make choices to control their own lives in ways that we may not be able to understand. Real healing as a community happens when all people feel comfortable taking off the masks of their own making and feeling that they can be real—first with themselves, then with the people around them—about what they’re experiencing emotionally.